Two of Blaine County's top law enforcement officers square off in the May 15 primary election to see who will represent the Republican Party in the sheriff's race in the Nov. 6 general election. Incumbent Sheriff Gene Ramsey, a former Bellevue city councilman and a candidate in his first election for sheriff, is running against Bellevue Marshal Larry Clark, who is running for office for the first time ever. The winner of the Ramsey-Clark race will compete in November against Hailey police Lt. Steve England, who is also a Republican but filed to run for sheriff as an independent. Ramsey and Clark have kept things cordial thus far for the primary election, with neither candidate publicly criticizing the other. Instead, both candidates are trying to put their best foot forward to show the voters who is the better man for the job. Because of new Idaho law, one thing is different about this year's primary. In order to vote for either Ramsey or Clark, a voter must be a registered Republican. However, that feat can be accomplished at polling places on election day. Ramsey, a 62-year-old Vietnam War veteran, has 42 years of law enforcement experience, counting the four years he served in air police with the U.S. Air Force. He started his police career with the Hailey Police Department in 1974 and then moved over to the sheriff's office where he's served for 34 years, with 32 of those years spent as the agency's chief deputy. When former Sheriff Walt Femling retired in 2011, Ramsey was selected for the job from a field of eight applicants. Ramsey, who was Femling's right-hand man, hasn't significantly changed things since becoming sheriff but said in an interview that he's tried to keep the agency going in the direction it was already heading. However, he did note that the sheriff's office needs to improve its public image. "I want us to be trusted in the community; I want to be involved in the community," he said. "The main thing that I want to do is continue the advances in law enforcement, that we continue the training, that we continue to be transparent. "I want all of my people to be exceptional," he said. Ramsey has done most of the hiring for the sheriff's office over the past three decades and said he enjoys watching people develop and grow. "Really, the main thing I'm proud of is the people in the sheriff's office," he said. "The other accomplishment I'm proud of is getting everybody going in the same direction." Ramsey said he's also trying to continue the agency practice of working cooperatively with other police forces in Blaine County. 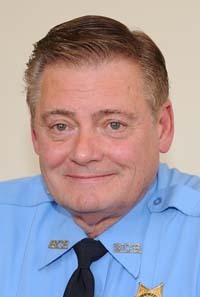 He noted that there could have been friction when Hailey Police Department took over the contract from the sheriff's office in 2011 to provide police services for the city of Bellevue. "At the time I had a lot of questions, but Bellevue did what they had to do with their budget constraints and I understand the reason they had to do that. We did a very smooth transition. "Law enforcement is still on the same side and we shouldn't have different agendas." Ramsey said he's not nervous about the upcoming primary election but that he's "taking it very seriously." "I'm very comfortable with the community. I want people to look at my record," he said. Clark is a 50-year-old Desert Storm war veteran with 20 years service in the U.S. Navy and nine years of police experience. He served four years with the Sun Valley Police Department before transferring to Hailey police, where he is still employed. He was appointed Bellevue marshal when Hailey police took over the city's law enforcement contract in October 2011. Clark said he enjoys being marshal. "I love it, I really do, all the great people I've dealt with. Bellevue's kind of a little treasure of the valley that most people don't realize. "Any top position is going to be political," Clark said. "It's not really difficult though if you can talk to people and see other people's points of view. "It's actually been pretty good. We've had a lot of compliments on our department since Hailey took over the contract." Clark declined to criticize Ramsey's performance as sheriff, but said instead that the office needs someone with a new perspective at the top. "Why would you talk bad about a place you want to be in charge of?" he said. "The reason I'm running is because I think the county needs a new set of eyes as it proceeds into the future. "I don't know if there's anything wrong, to be honest with you," Clark said. "I've had people bring concerns to me, and I don't know if they're true, but I would look into them if elected. "Looking from the outside in, I hope there's nothing broken." Clark and his wife are the owners of the Golden Elk restaurant in Hailey. "She does everything at work—I run the books. Everyone once in a while I have to cut meat for her, but I do all that on my weekends and after work." Specifically, Clark said that if elected he will try to improve communications with other law enforcement agencies and emergency services in the county, will increase drug education programs in the schools and will improve police coverage in the more remote areas of the county. "If the county is ready for a change, they'll vote for me on May 15. If they're not, I'm happy with Bellevue," he said.